The Ashley Larimer Rectangular End Table features a clean-lined and contemporary piece that doesn’t skimp on function. Bottom shelf lends display space for accessories and whatnots, and three drawers keep essentials out of sight. An elegant finish allows the rich veneer grain to shine through. Dimensions: 20" x 23.75" x 23.25"
The Larimer Rectangular End Table T654-2 has many exciting features for users of all types. 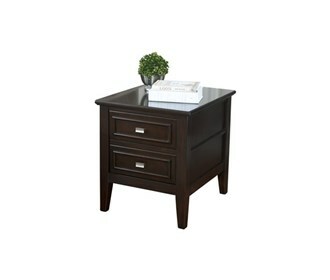 See the Larimer Rectangular End Table T654-2 gallery images above for more product views. The Larimer Rectangular End Table T654-2 is sold as a Brand New Unopened Item.